This is a recipe for homemade meatballs simmered in a tomato sauce, served over some tagliatelle. As (almost) always this recipe is very easy to freestyle, add and subtract ingredients as you wish. I might upset some pasta aficionados and/or Italians by my next sentence, but hey - it's been some time since I last upset someone. After I've drained the pasta I normally put it back in the pan and take a couple of spoons of the pasta sauce and swirl around in the pan. Sort of coating the pasta with the sauce. Not sure if that's the proper thing to do, but I do it. Mix the mince, parmesan, shallots, garlic, egg and season. Let it set for a bit and then roll the meatballs, wet your hands and it's easier. Once the meatballs are done you can heat up the olive oil in the frying pan and fry off the meatballs. When they start to get a bit of colour you can add the onion and keep frying for a bit. Add the tomatoes (I blitzed mine to get rid of the 'lumps'), stock, roasted peppers, chili flakes and the torn basil. Let this simmer away on a low heat. Did you forget about the tagliatelle? Crap. Time to get some salted water boiling and have a look at the packaging to see how long the tagliatelle needs to boil for. Let the tomato sauce simmer further. Once the pasta is done and the sauce has reduced nicely, drain the pasta. Put it back in its pan and add a couple of spoonfuls of the pasta sauce and mix it up. 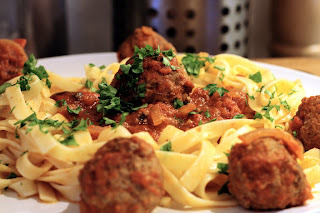 Put tagliatelle, meatballs and tomato sauce onto your plate. Finish off with some fresh chopped parsley. Forget pasta aficianodos - lol...who cares about them? j/k - I'm sooo for breaking the rules. I'm loving your whole toss the pasta in the sauce idea - I'm going to have to give that a try....I love that idea, really. The meatballs looked damn good! Thanks for the kind words about the meatballs. I had a look at your blog and it looks very interesting.